Technetium-99m (99mTc) is a radiometal that has nearly ideal nuclear properties for diagnostic nuclear medicine imaging, which has helped make it high impact and extensively utilized radionuclide in medicine. 99mTc-based imaging—which can be done using a simple gamma camera or a more advanced 3-D method known as single photon emission computed tomography (SPECT)—has been a mainstay of diagnostic nuclear medicine for decades. In this chapter, we provide an introduction to the nuclear and coordination chemistry of 99mTc, emphasizing areas that relate to its use to create radiopharmaceuticals. The ease of access to the radionuclide is described along with how one can take advantage of the many oxidation states of technetium and unique ligand environments to create a diverse array of radiopharmaceuticals. Several established clinical agents are presented as examples along with details of their structures, methods of preparation, and diagnostic utility. 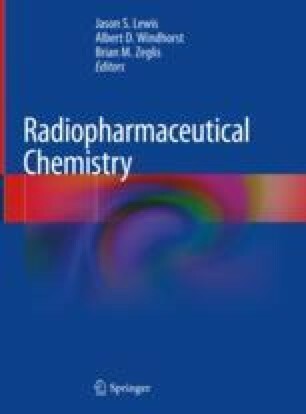 This discussion is followed by detailed descriptions of the procedures used to prepare and characterize selected 99mTc-labeled compounds that can be used to create the next generation of targeted radiopharmaceuticals, along with commentary on the influence of chelators on the pharmacokinetics of 99mTc-based radiotracers. Additional information concerning the characterization and evaluation of novel constructs is provided as well, including ligand challenge, stability, and other useful assays as well as how to prepare for biodistribution studies. It is important to note that this chapter was written as an introductory guide for those who are new to the field and is not a comprehensive examination of the chemistry and nuclear medicine applications of 99mTc. A more comprehensive treatment of this material can be obtained from a number of excellent review articles. Yaes RJ. Clinical review, Tc 99m Sestamibi. U.S. Food and Drug Administration 2 Apr 2008. NDA 19-785. https://www.fda.gov/downloads/Drugs/.../DevelopmentResources/ucm072825.pdf. Accessed 7 Apr 2018. Myoview 30 mL Kit for the preparation of technetium Tc99m tetrofosmin for Injection. GE Healthcare. 2011. http://www3.gehealthcare.com/en/products/categories/nuclear_imaging_agents/nuclear_pharmacies. Accessed Oct 2017. DMSA kit for the preparation of technetium Tc99m Succimer Injection. GE Healthcare. 2006. http://www3.gehealthcare.com/en/products/categories/nuclear_imaging_agents/nuclear_pharmacies. Accessed Oct 2017. Draximage DTPA kit for the preparation of technetium Tc99m pentate injection. GE Healthcare. 2016. http://www.draximage.com/products/us/draximage-dtpa/. Accessed Oct 2017. Technescan MAG3 kit for the preparation of technetium Tc99m mertiatide. Curium Pharma. 2015. https://curiumpharma.com/wp-content/uploads/2017/02/Tscan-MAG3-a096i0-in-1015.pdf. Accessed Oct 2017. Ceretec kit for the preparation of technetium Tc99m exametazime injection. GE Healthcare. 2013. http://www3.gehealthcare.com/en/products/categories/nuclear_imaging_agents/nuclear_pharmacies. Accessed Oct 2017. Neurolite kit for the preparation of technetium Tc99m bicisate for injection. Lantheus Medical Imaging. 2015. http://www.lantheus.com/assets/Neurolite-US-PI-513073-0415-format-6-1-29-2016.pdf. Accessed Oct 2017. Kit for the preparation of technetium Tc 99m sulfur colloid injection. Rev. 1.1 Pharmalucence. 2013. http://www.pharmalucence.com/images/SC_PI.pdf. Accessed Oct 2017. Scherr D, Karnes J, Slawin K, Keane T, Trabulsi E, Ellis W, et al. A phase 2 study with MIP-1404 in men with high-risk PC scheduled for RP and EPLND compared to histopathology. 2012. clinicaltrials.gov/ct2/show/NCT01667536. Acceessed 8 Apr 2018.